According to the donor's family history, this quilt was owned by a resident of Backworth, Northumberland, in the early twentieth century. 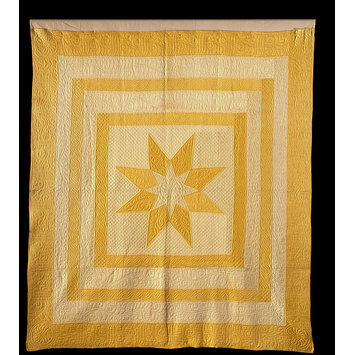 The design is based on the popular 'Sanderson Star', originally designed by the quilt designer Elizabeth Sanderson, and much emulated in the first decades of the twentieth century. 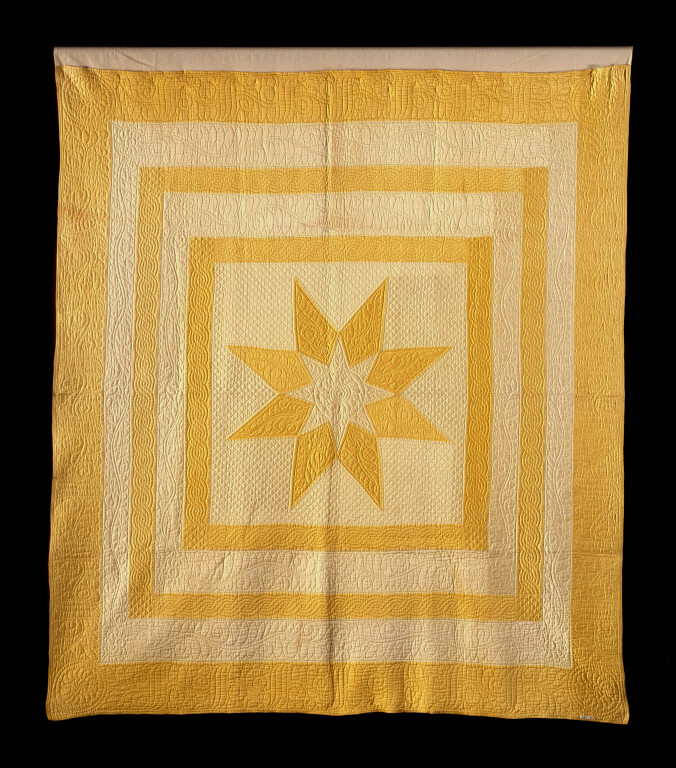 Although this quilt cannot be attributed to Sanderson, the design testifies to her significance as a designer and teacher. First apprenticed to the renowed quilted George Gardiner, Sanderson went on to built her own formidable career as a quilt top marker or 'stamper'. For between 1s.6d. and 2s. she would mark out a quilt top in blue pencil. The top could then be quilted by either professional or domestic quilters. At the height of her career she was marking up to two quilts tops a day. Sanderson also ran an apprentice system, training young girls in stamping at her house so that they could eventually be hired as professional markers. Bed cover made of quilted patchwork of cotton sateen. The design shows an eight-point pale-yellow star, surrounded by four narrow pieced borders and a wide outer border, alternately pale and bright yellow. It is quilted within each border in several designs, including a running leaf pattern in the two pale-yellow narrow borders. The outermost border has a quilted design of flowers and leaves. It is quilted with cotton thread. The reverse is of pale-yellow sateen. According to the donor’s family history, this quilt was owned by a resident of Backworth, Northumberland, in the early twentieth century. 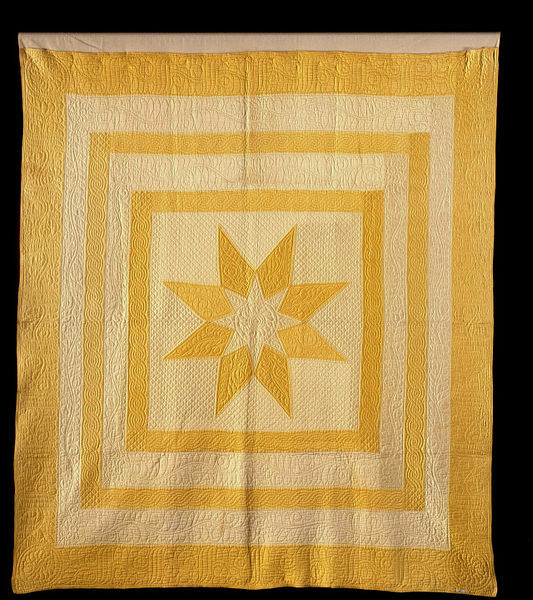 The design is based on the popular ‘Sanderson Star’, originally developed by the professional quilter Elizabeth Sanderson, but much emulated in the first few decades of the twentieth century. Historical significance: At the start of the 20th century, increased access to mass-produced goods such as bed covers marked a decline in traditional needlework skills. Quilt-making survived in economically deprived areas such as Wales and the north-east of England, where the design and sewing of quilts were both an important means of self-expression and a way of earning money for widows and families with no income. Although this quilt cannot be attributed to Sanderson, the design testifies to the significance of her role as a designer and teacher. First apprenticed to the renowned quilter George Gardiner, Sanderson went on to build her own formidable career as a quilt-top marker or ‘stamper’. For between 1s.6d. and 2s. she would mark out a quilt top in blue pencil. This could then be quilted by either professional or domestic quilters. At the height of her career she was marking up to two quilts a day. Sanderson continued to support the professional apprentice system. At around the age of 14, girls would work for her unpaid while they carried out their training, which usually took between six months and a year. Sanderson offered them board during the week, and at the end of their training the apprentices could be taken on as professional markers. Bed cover of quilted cotton sateen, probably made in Northumberland, England, ca. 1900. The design of this bedcover, originally conceived by Elizabeth Sanderson, was much emulated in the early 20th century. Although this quilt cannot be attributed to Sanderson, it testifies to her significance as a designer and teacher. She had a profitable career as a 'stamper', marking out quilt-top designs in blue pencil for quilting by professional or domestic quilters. She ran an apprentice system, training young girls in stamping at her house so that they could eventually be hired as professional markers.